You’re not just taking on another business, you’re taking on somebody’s life’s work. David Samuels is a corporate executive benefits designer. In the course of his career, he has also bought out seven other companies that do similar work. This means he helps business owners transition themselves out of the business and into retirement. These transitions can be difficult to manage, which is why David explains his unique process on how he gets the job done, where everybody involved in the deal comes out a winner. What were the key takeaways? [2:15] What does a corporate executive benefits designer do? [4:05] How did David discover this career field? [7:35] Before David begins work with a client, he first has them take a compatibility test to see if they’re a right fit. [8:55] What does the compatibility test entail? [9:35] When there’s a winner, there’s always a loser, and David hates that. He wants to have a win-win scenario for both the buyer and seller. [10:30] David needs to know he’s working with someone of integrity and honesty. [10:55] The entrepreneur’s books have to be clean. [12:10] Why is finding the core needs of the seller so important? [12:25] You’re not just buying a business, you’re buying somebody’s life’s work. [15:35] Is the seller jumping in front of the train or is he being pushed? [17:15] What happens if a deal goes bad? [20:35] Transitions take time. If the owner wants to retire quickly, their staff is going to feel abandoned. [24:35] At the end of the day, David wants his clients to feel great about the deal. David wants them to always know that he’s got their back. [26:40] As business owners are looking to retire, they’re trying to cut back on their overhead and simplify their lives. David, so to speak, takes on those complications. [29:05] Even though David has to do extra work, he firmly believes in a 50/50 monetary split. [36:50] How does David evaluate a business? [42:50] It boils down to having extensive conversations with the business owners to understand what they do and what David will do. 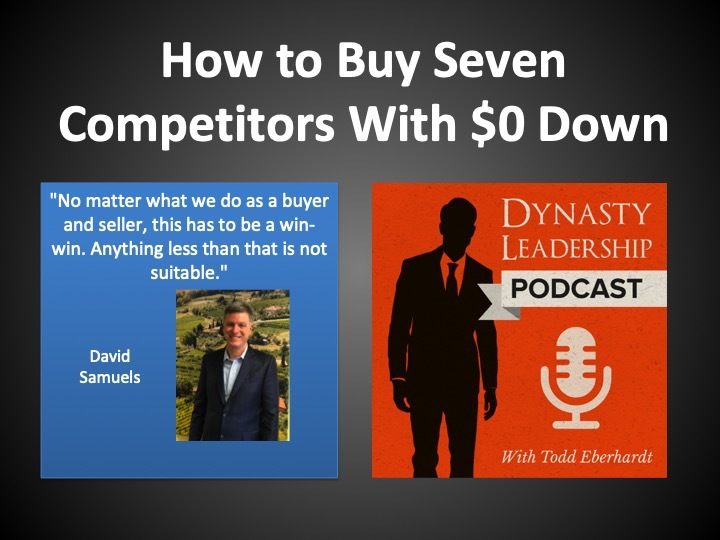 [46:20] David has been in this business for 27 years and has done 7 acquisitions. What kind of lessons has David learned throughout his career? [49:55] What has the turnover been like once David has acquired a business? [51:30] When a takeover happens, David often sees an increase in clientele. How is this possible?